God is not about condemnation. I know that Satan got the rumor started a long time ago, but don't believe it. God is not some fiendish teacher looking to flunk and embarrass students. God is not some cantankerous judge looking to shame, humiliate, and punish all who appear in court. God is not some gossip spreading rumors about our shortcomings across the neighborhoods of heaven. The one true and living God wants to bless us with his salvation. He wants to dispense mercy and grace. He wants us to be his children. Yet he is also holy, righteous, awesome, and just. So when God's gracious desire for us collides with God's call for reighteous character, there is only one solution: Jesus! Jesus came to fulfill God's righteous demands with his gracious provision of mercy. 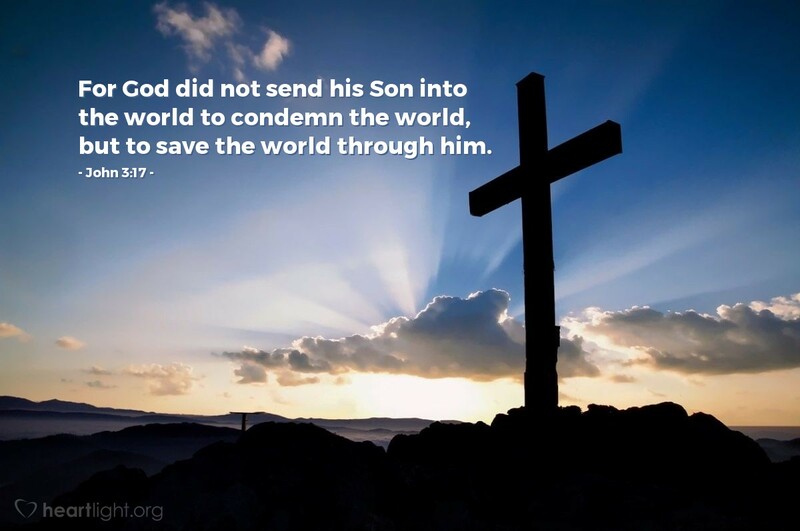 God sent Jesus to save sinners. Jesus came to save people from all nations and races and cultures from sin and the penalty of sin. Jesus came to save us! I praise you, O God, for your desire to save me. I thank you for demanding holiness from me to save me from the havoc sin causes in my life. I thank you for calling me to righteousness, so that my life will be a blessing to others and not a burden. I thank you for challenging me to have your character, so that others can see your glory in my good deeds. So please use me, Father. I know I am flawed, but I want to be one of your tools letting the lost know about your mercy and grace in Jesus. In Jesus' name I pray. Amen.